This week's Thursday Tips blog post will be short and sweet, and early. I've got some stuff going on at the end of this week, so I wanted to make sure that this post goes out now, or it never will. I want to discuss the KISS (Keep It Simple Stupid) principle of photographic composition. Often, creating a good composition is about what you don't include in the frame, rather than what you do. You should always try to describe to yourself what really attracted you to a particular scene or subject and then take the necessary steps to eliminate anything from the frame that doesn't match, or at the very least detracts from, what you just described. Our eyes and brains are very good at filtering out extraneous elements, integrating a very complex scene, and/or focusing on the beauty we see before us, when we are out in the field. But when it comes to making an impressive graphic image, particularly for someone that wasn't out in field enjoying the magic with you, simplicity is key. Take the image above of a rose at Brookside Gardens in Wheaton, MD as an example of the point. 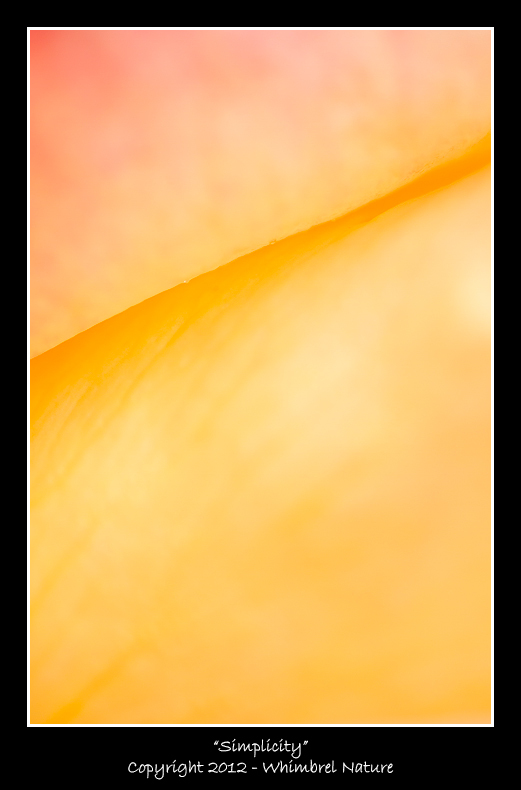 While the abstract nature of this image may not suit everyone's taste, I was particularly attracted to the soft curves of these rose petals, their color, and the delicate colorful fold running between them. The first thing I did, was to move my tripod into such a position that my macro lens cropped out any other nearby folds or petals. I removed any other element or line that was not what attracted me to this particular flower in the first place. However, then I had a new problem. At that magnification (just about life-size), every minor ripple, fold, and spot of pigment in the petals would become very prominent and distract from the soft curves and overall color that attracted me in the first place. The solution was to open up my aperture on my macro lens to its maximum amount f/3.5. This is the opposite of what I usually do with macro images where I'm fighting for every tiny scrap of depth of field I can get. But in this case, opening up for an extremely shallow depth of field simplified the image and allowed me to emphasize the elements that made this particular bloom so special. I hope you are enjoying these Thursday Tips posts and if you missed them, check out my previous posts on composing carefully using Live View, finding good places to photograph, and photographing frogs and toads. This image is gorgeous, the colors are terrific and the simplicity of it is very appealing to me. This image is awesome. Love the color!!! Oh man, this is sweet! You are rockin' the casbah with pictures like this.